Stripped and ready for action. The decision to get cracking on the bike coincided with two pieces of good fortune. First, work called just before I started on it to ask if I’d mind staying at home that week as there wasn’t enough work going through the studio to keep me busy. Regret that I wouldn’t earn any money that week was countered by the prospect of getting a fair crack of the whip on my bike build, so a reasonable result. Then, to my utter surprise, the weather turned unseasonably warm and sunny for about a week, perfect for fettling bits of metal out in the shed and garden. Having wrestled the bike into the back garden, no easy task given a very narrow access alley out back and the need to fit some much reduced width handlebars, the strip down was quick. Originally I’d built it in a way that would enable me to take it apart if I ever needed to and so was grateful for having made that decision. The work plan was front mudguard first, then the clocks and headlight area and finally the rear mudguard. After a quick once over and a clean it was time to get started. I’d sketched out several solutions for mounting the front guard but, in the end opted for the simplest one which used two straps or hoops connecting the mounting holes on the fork legs with the guard mounted on top. Ok, not that elegant, but essentially all you need and adhering nicely to one of my general philosophies when approaching making anything, which is the KISS principal (Keep It Simple, Stupid). Due to the front forks having a leading axle arrangement, the mounting holes are off-set to the wheel centre so the straps needed to be of different lengths, and so I slotted the holes on the rear one to enable some positional adjustment when finally mounting the guard. Trimming the guard from the longer piece of rolled section I had was relatively easy, the tricky bit is joining it all together. For this you need to find the centreline of the guard, awkward on a thing that curves in two planes. My simple solution was to lie the piece on its side and establish the centreline as a height rather than a width, using a pen taped to an adjustable square. That done, it’s much easier to define the hole positions for your fixing screws or rivets to attach the mounting straps. Nothing worse than drilling holes only to find they’re in the wrong place. With the holes drilled I screwed the whole thing together using some M4 button headed screws and thread lock compound. Doing it this way allowed me to tighten things up just so, and minimise the risk of pulling the surface down onto the straps too much and dishing the top surface. The rolled mudguard blanks came with a polished finish but this is a nightmare to maintain, so the final thing was “brushed” with Scotchbrite before a treatment of anti-corrosion spray. Ok so far. Next up, the clocks and front light area. 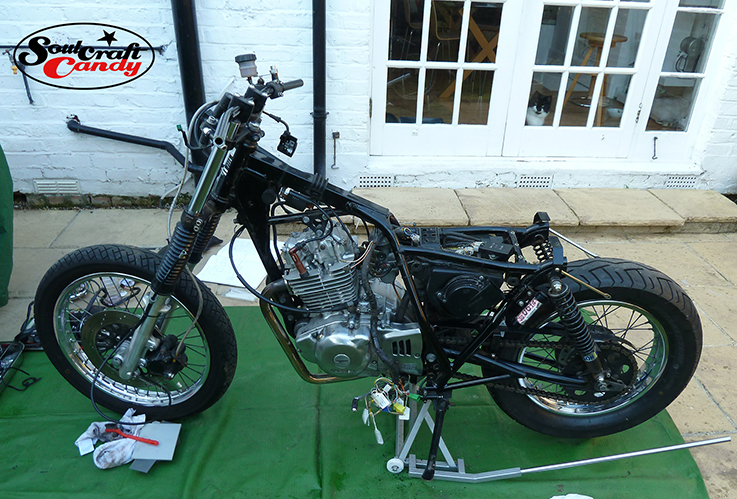 This entry was posted in Bike build, Creativity, Customising, Designing, Detail, Graph paper, Metals, The shed, Time management and tagged Custom build, finishing touches, Making, Motorcycle modifying, Suzuki GN250 by Soulcraftcandyman. Bookmark the permalink.